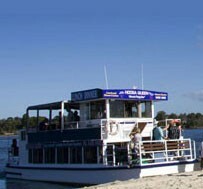 Come aboard and enjoy the fun atmosphere of Noosa’s favourite riverboat. For the best value on the Sunshine Coast, join us on the Noosa Queen for our $10 Sunset Cruise. Enjoy a cold drink from our fully licensed bar as we pass by Richard Branson’s Makepeace Island to view the natural surroundings, wildlife and spectacular sunsets of Lake Cooroibah. Returning 90 minutes later, you will be thoroughly Relaxed & Revived. Our 2 ½ hour Lunch and Dinner Cruises also travel down river to view the waterfront homes of Noosa Sound’s “Millionaires Row”. We are also available for Private Charters. Weddings, Birthdays, or any Special Occasion. Know that we will go out of our way to ensure that you and your guests have a memorable Noosa River experience. Undeniably Noosa’s most affordable cruises.